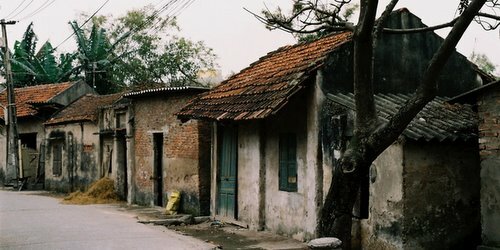 Published: 03:08 Saturday - June 23, 2012 Located in Cu Khe Commune, Thanh Oai District, Hanoi, Cu Da is considered as one of the two most ancient villages in the former Ha Tay. Its ancient beauty attracts a lot of tourists and researchers both in and outside the country. Cu Da Village lies on the bank of the Nhue River, about 15 kilometres from Hanoi capital, bearing characters of a Vietnamese village with hundred-year-old banian-trees, rivers, ponds, village wells. It is really a symbol of Vietnamese ancient villages in the northern delta areas and it also hides cultural sediments of great values that have still been kept intact today. Villagers here still keep traditional and neighbourly lifestyle which has been maintained from generation to generation. Thus, once visitors coming Cu Da, they will find it easy to inquire the way to some family in the village. This is really a respectfully cultural feature of Cu Da people. In thẻ 1920 and 1930s, thanks to the favourable location ‘near the market and the river’, Cứ Đà was a very active place for traders to do business all day and night. As a result, It’s economy was developed quickly and the living standard of villagers was improved considerably compared to other regions. The villagers moved to all regions in the country to do business and settle down there. Many people who were better off had come back to the home village and brought along with them the cultural characters from the city. The cultural features of Cu Da have been preserved intact which serve as an evidence of a flourishing development period. The most extraordinary relics in Cu Da are 50 French-style villas. Partly damaged by time and historical changes as they were, these houses are still kept intact with typical French style. These are two-storey villas with balcony, archway, enamel tile-paved pillars, porcelain-paved walls and so on. 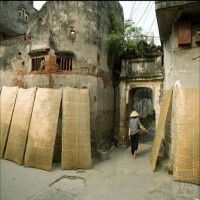 Tiles to pave and decorate houses were all made in France in 1910 – 1920 and imported to Vietnam. Architectural patterns and designs of these houses remain, showing the harmony from eastern to western architecture in the early years of the 20th century. Not only bearing European-style architecture, but also Cu Da is imbued with traditional values of a riverside village in the northern delta area. Cu Da is also famous for other ancient communal houses which are used to celebrate common activities and festivals of the whole village. Such unique relics on a flourishing development period of Cu Da riverside ancient village have made it a extremly interesting tourist destination, attracting an increasing number of visitors and researchers in and outside the country. 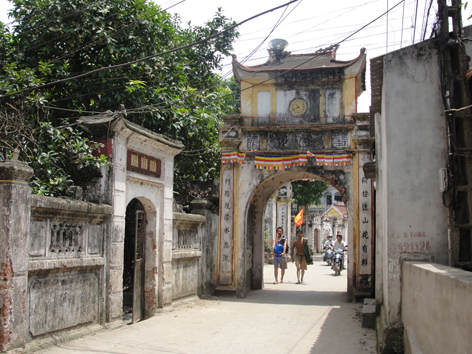 Cu Da ancient village- an archaic beauty, Phuoc Tich - Village of beam manors. You also can visit our sites: Nature & Adventure, Nightlife, National Parks, Villages.